Footpath signs are simple and highly effective. Located near your business where signs are easily visible to foot traffic, footpath signage gets your message across. 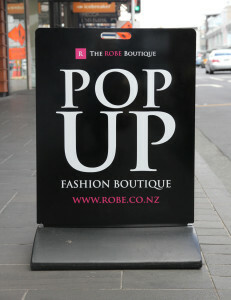 Footpath signs help attract people into your shop and promote products and offers to passers-by. Use your business name and a call to action on footpath signs or distribute them to your brands re-seller outlets. There are a range shapes and sizes available including different weighted bases for all weather conditions.